Minimal extra-column band broadening is required to take full advantage of the highest efficiency GPC columns. The EcoSEC GPC System is engineered to minimize system dead volume. In addition to the compatibility of conventional columns, the semi-micro design allows the use of GPC columns with smaller ID (4.6 mm) and shorter lengths (15 cm) such as the TSKgel SuperMultipore and mixed bed columns. Together with a small stroke volume pump and a 2.5 μL RI flow cell, the EcoSEC GPC System allows accurate and precise molar mass measurements, particularly when benefiting from state-of- the-art column technology. As shown in Figure 1, when run on the EcoSEC GPC System, the TSKgel SuperMultiporeHZ-N (4.6 mm ID × 15 cm) column achieves separation efficiency equivalent to that of a conventional high speed column (7.8 mm ID × 30 cm), but analysis time is reduced to half that of a conventional column and one-sixth the amount of solvent is consumed. 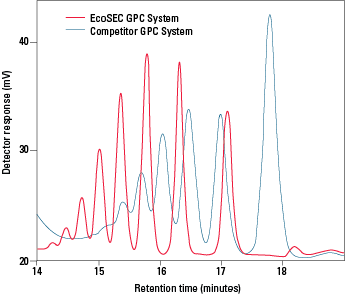 The combination of the EcoSEC GPC System and semi-micro columns provides significant solvent related cost savings while doubling sample throughput without compromising resolution. As shown in Table 1, the solvent related cost savings are extraordinary for samples requiring expensive solvents such as hexafluoroisopropanol. 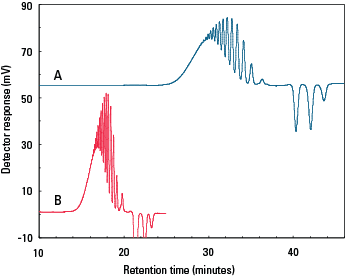 Figure 2 shows an example of an oligomer (A-500) separation using four TSKgel SuperHZ2000 GPC columns in tandem performed using an EcoSEC GPC System and a competitive GPC system. A faster analysis and improved resolution is achieved with the EcoSEC GPC System as a result of the advanced engineering design of the system.